The reality of having batteries in a power system is that once the batteries have been drained, they will inevitably need to be recharged. Victron Energy are renowned world wide for their superior build quality and reliability in the field of battery chargers. 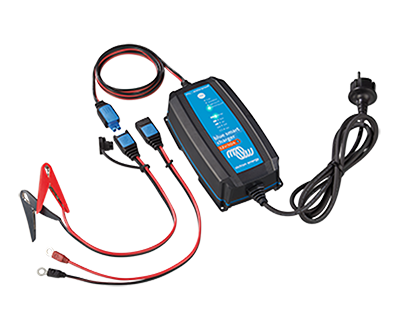 Whether your application requires light charging of a small battery bank or intense charging of a large battery bank, there is a suitable charger available from MPE-Online that will provide you with years of trouble free operation while insuring your expensive investment in batteries is protected. Get the most out of your battery charging with Victron’s microprocessor controlled charging algorithms for exceptional battery management. As a standard feature built into the Smart range of chargers you can now connect your Smartphone to your battery charger using Bluetooth for easy control and management of the battery charging process.